You look back at arcade games of 1983, and you'll remember just how basic the graphics normally were... and then you look at something like Tapper or Timber by Bally Midway. Alright, Dragon's Lair was around then too, but that's a laserdisc game and not a real arcade game in comparison. Anyway, the point I was making was that compared to arcade games like, for example, 10-Yard Fight, the graphics on Bally Midway's games was the equivalent of High-Definition TV these days. 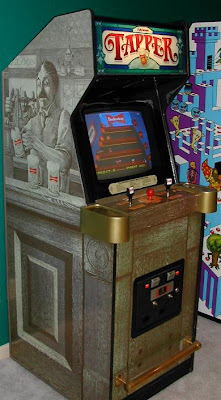 Not only were the graphics top-notch, but the arcade cabinet was slightly unusual too, featuring a foot rail in the style of a real bar itself, and beer taps along with a joystick for controlling the game. Yes, ACTUAL BEER TAPS. As the server of drinks, you're required to keep the many and varied thirsty punters adequately watered by filling and flinging drinks down the bars to them. Each screen has four bars for you to keep an eye on, and the simple object is to empty the screen of customers by forcing them back out of the doors by continually supplying drinks. Supplying too many drinks and smashing a glass or letting a punter reach your end of the bar is an instant loss of a life, though. Sometimes a punter won't go back out the door after one drink, they'll stop and finish their drink and ask for more, flinging the empty glass back in your direction. Again, don't let it fall off the end of the bar, or that'll be another life gone. You can run along the bar to collect empties (or tips), so if time allows that might be a better option. Collecting tips can be both helpful and fatal for you... as soon as you collect a tip, some form of entertainment will begin in the background. Whatever the entertainment might be, SOME of the punters will be distracted and no longer advance towards you, but they also won't pick up a drink if you sling one in their direction, and, in case you haven't guessed, sending too many drinks down the bar for them to smash against the doors... will cost you a life. And then there's the bonus level between scenes... The Bandit will shake up 5 of the 6 cans waiting on the bar, not only must you remember which one was NOT shaken, he then mixes them up to make life more fun for you. 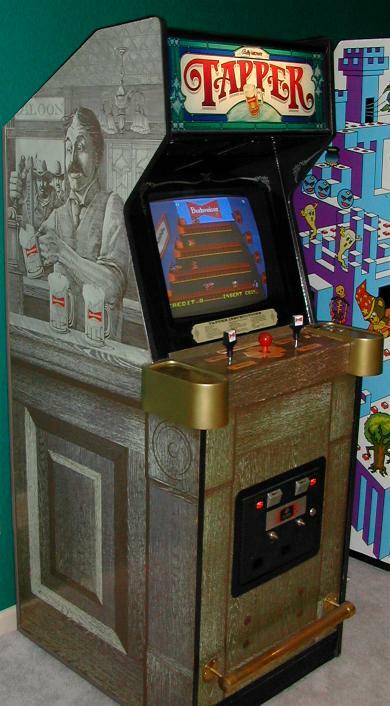 The game was originally all about serving beer, obviously, but it also got a family-friendly overhaul as "Root-Beer Tapper", replacing some of the graphics so that the barman now looks like a "Soda Jerker", for example. Obviously the worry was that kids would become alcoholics or something, but as we all know, if video games influenced our behaviour, we'd all be dressing up in yellow costumes, wandering round mazes and eating pills, going "Wakka Wakka Wakka Wakka" all day long. Hmm. Anyway, to surmise, then: Tapper is a great game that LOOKS way ahead of its time. It's challenging, but it's all good fun. If you're lucky enough to find an original working cabinet, don't waste any time, get your money in and enjoy 80s arcade gaming at its best.